We work closely with our strategic partner in providing job placement for our graduates. Please check out this section regularly for new vacancy advertisement that might be published from time to time. * Interested candidates, please email to students@swck.edu.my and quote your student numbers and names. we need extraordinary people like you. Are you looking for new challenges? A nurturing environment that actually values your drive and independence of mind? If so, we respectfully suggest talking to us. We are Crowe. The 5th largest accounting firm in Malaysia and a member of a top 10 global accounting network. We are hungry, energetic and looking for more people to join our family. Our goal is to make the extra, ordinary. Which means attracting extraordinary people and giving them a chance to shine. If that sounds like the sort of employer you’d like to employ, please contact us right away. •1 year of relevant work experience. Fresh graduates are also encouraged to apply. Crowe Malaysia AF1018 is a member of Crowe International, a Swiss verein. Each member firm of Crowe International is a separate and independent legal entity. Crowe AF 1018 and its affiliates are not responsible or liable for any acts or omissions of Crowe International or any other member of Crowe International and specifically disclaim any and all responsibility or liability for acts or omissions of Crowe International or any other Crowe International member. We are an established Chartered Accountants firm based in Kuching seeking for suitably qualified individuals who are mature, inspired and well disciplined candidates to join and grow with our professional teams. Possess a recognised accountancy qualification or relevant degree. Minimum 2-3 years relevant experience. Ability in client handling and staff management. Strong analytical and leadership qualities. CAT or LCCI graduates who are pursuing ACCA course. 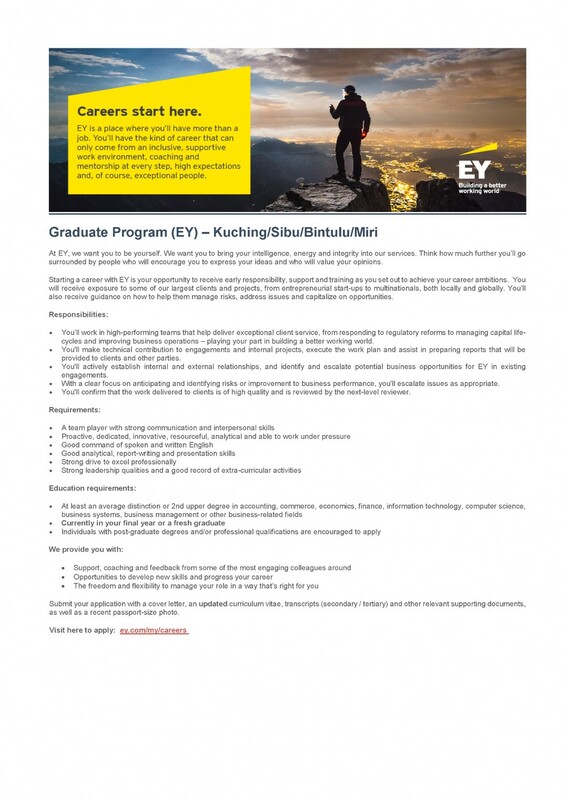 Fresh graduates in accounting.or business degree or diploma are encouraged to apply. experience. All applicants will be treated with strictest confidential. Kolej Sunway Kuching recognises the importance of protecting your personal information and is committed to the compliance of the Personal Data Protection Act 2010. All personal information collected in this regard will be used solely for the purposes of and used for consideration/ recruitment of suitable candidates.